Warmup’s range of heating cables include systems both for new construction and renovation. Warmup Inscreed Cable is designed for installation in concrete screed. Suitable for almost any floor finish and especially for areas where the floor covering may be subject to change multiple times in the heater’s lifetime. Warmup’s heating cables have various different applications. 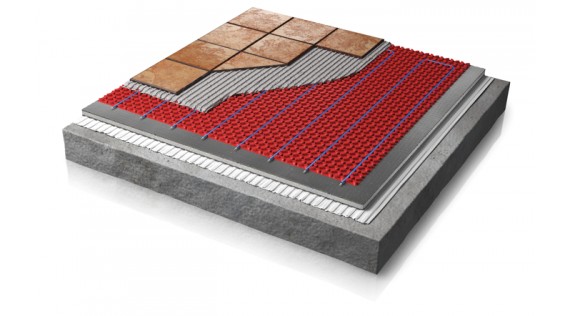 While the WIS heating cable is a system designed to be embedded within a layer of screed, the DCM-Pro system and the DWS heating cable are designed to be applied directly to the final floor covering. The WIS heating cable is the system of choice for new constructions. The installation can act as a heat accumulator, slowly releasing the heat to the floor. There is a high thermal inertia, thus it is possible in well insulated homes to take advantage of the cheaper night time electricity tariff. The DCM-Pro system is an innovative new system from Warmup that allows a quick and easy installation, saving both time and cost. The system suits all floor types and protects the floor finish from seasonal changes that may cause cracks in the floor finish. The DWS heating cable is designed for installation under ceramic or stone floors. It is usually used instead of the heating mats in small and irregular shaped areas. The metal fixing bands are used to help fixing the WIS heating cable to the floor.